Our garden has had two nights of rest following a long stretch of really, really fun parties...which ended up with really, really tired owners. So, on night two of rest and feeling, well, rested...we decided to tackle some homemade ravioli. I'm up to speed in bread making and have even felt like my pasta making skills are pretty good...but ravioli? Well, it's a two person job. You make the pasta. You make the filling. You drink a little wine. You roll the pasta. You put it in the fancy mold you got for Christmas. You drink a little more wine. You fill the pasta. You learn, after the first batch, that there's no such thing as too much flour. You drink even more wine. Oh, and in an effort to clean out your fridge before a vacation, you start adding things to your menu...things like some leftover pizza dough that you douse with olive oil and rosemary and throw on the grill. And shed a tear or two at how great it tastes. Seriously. Some leftover gravy, a table full of boys (and an extra girl!!!) and there you have it. What was supposed to be a normal Tuesday became something not so normal. Next on the summer list? Gnocchi. Also on the summer list? Exercise. 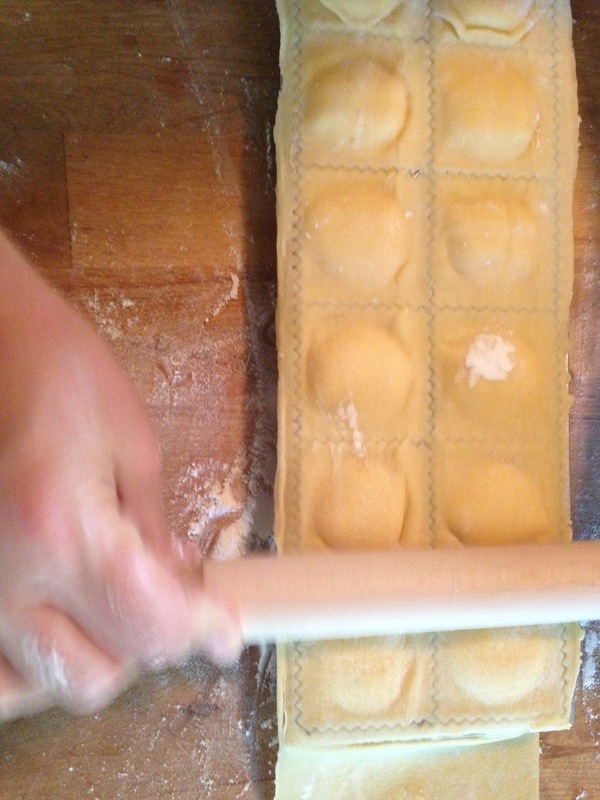 I'm by no means an expert in ravioli making, but I have a pasta recipe that I have been using over and over. I quadruple this recipe every time I make it. Put flour on the counter and make a well in it. Add egg and salt in the middle and using your hands, mix in the flour a little at a time. Knead until smooth, adding a little water (or flour) if necessary. Let rest on the counter, covered with a bowl, for 30 minutes. Roll out (making sure to use plenty of flour to prevent sticking) and cut as desired. Cook in salted, boiling water for 3-4 minutes. Mix all together. Use as a filling for ravioli or manicotti or lasagne. 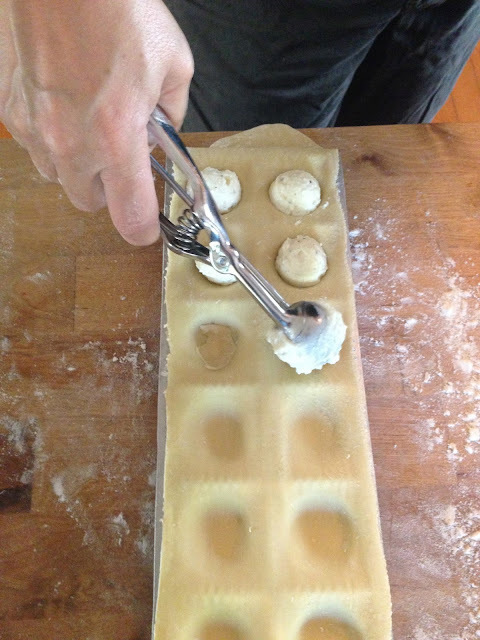 For ravioli, we used a hand crank pasta machine and rolled the dough to #6, filled the dough using a mold and boiled for 5 minutes. They were all eaten in half that time...but so worth it!